Thermaltake released the Riing Silent 12 Pro heatsink, showing off their then-new 120 mm fan. This cooler has been out for a few years but we’re getting the opportunity to test it here today to see how well it performs in our testing suite. Coolers based on a 120 mm design typically need faster fans to improve their cooling capacity which in turn creates more noise, but this one doesn’t spin so fast. It is designed to be very quiet. We’ll put this cooler to the test and see if there’s a trade-off between cooling performance and audible noise and if that “Silent” in Thermaltake Riing Silent 12 Pro is justified. 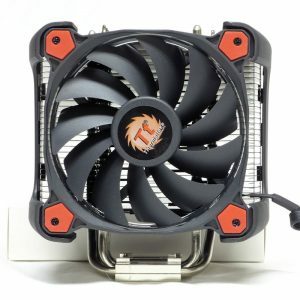 On their product page, Thermaltake has a lot to say about the design. 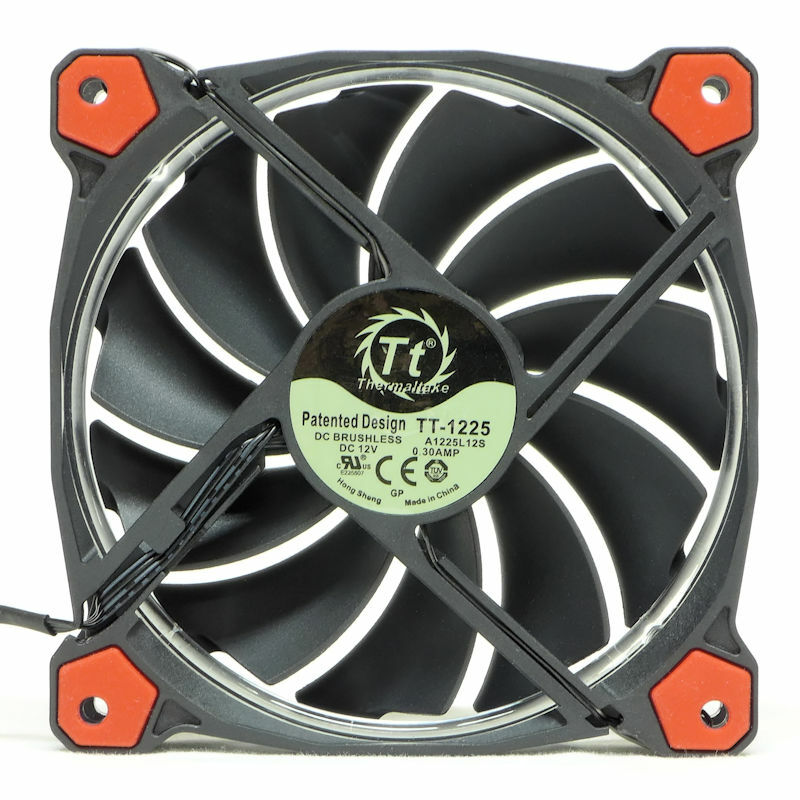 For one thing, they tout the eleven-blade fan with specially designed blades to enhance airflow. The fan is assisted in this by their frame, which they call a “wind blocker frame.” It was “designed to direct airflow towards the middle section of the blade, thereby creating a compression effect and blocking any air from escaping.” They further describe the fan’s fluid dynamic bearing, showing us a nice diagram, perhaps the best diagram ever of an FDB. 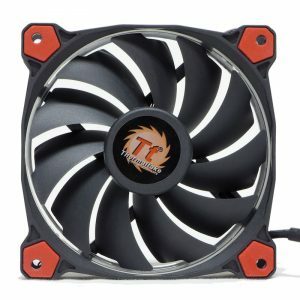 Thermaltake has taken steps to make this a quiet heatsink, the fan has vibration-absorbing pads at all four corners and a pair of fan clips that further attenuate sound. Finally, let us not forget the Riing LED, which they advertise as a patented feature. 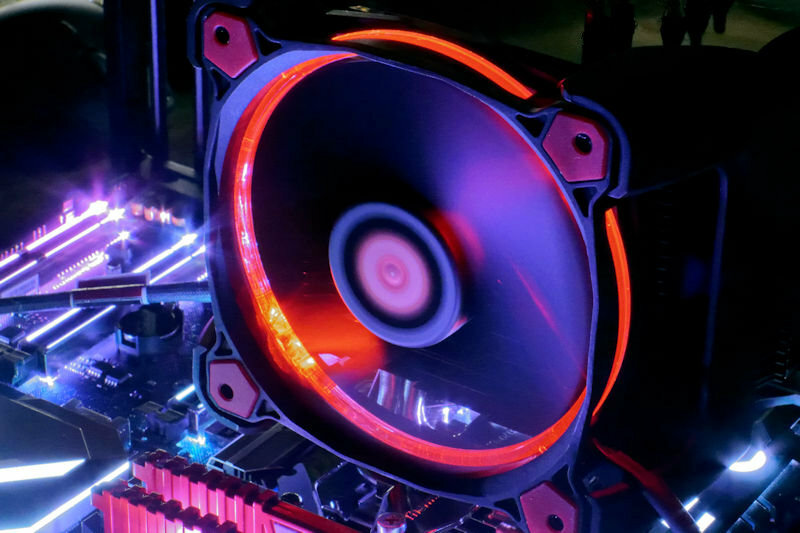 Thermaltake sent a heatsink with Red accents and LED as well as being available with blue accents. 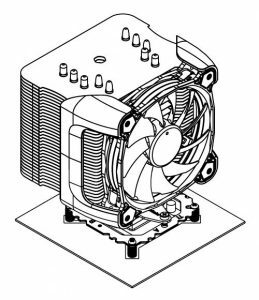 Thermaltake provides online manuals (PDF) for AMD and Intel installations. 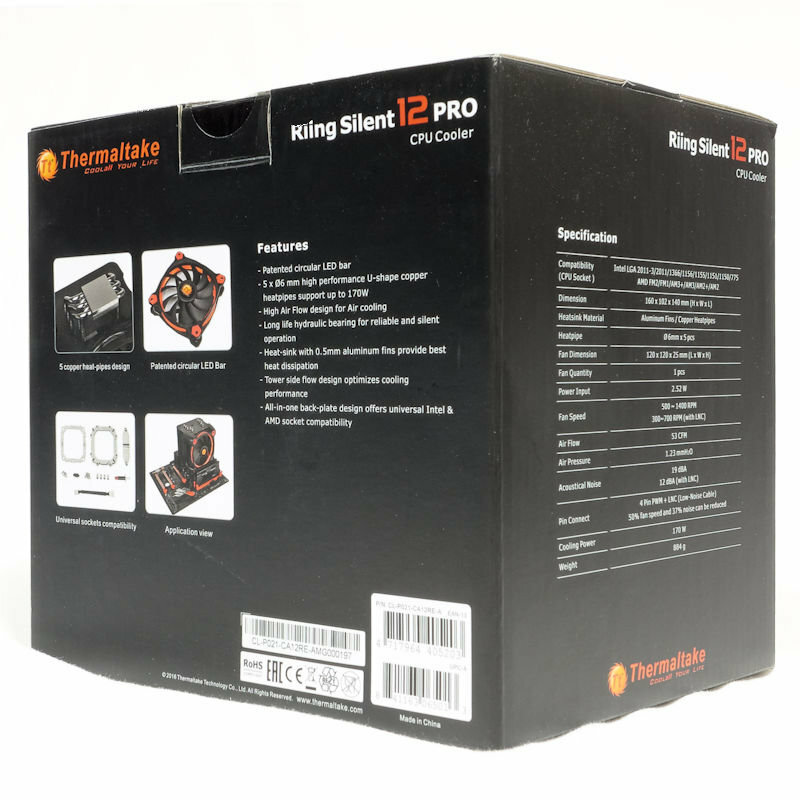 The Silent 12 Pro comes in a box with its picture on the front along with a prominent mention that it includes a Low-Noise Cable. On the left side of the box is a list of specifications. The back of the box has several pictures of the equipment inside along with a list of features. 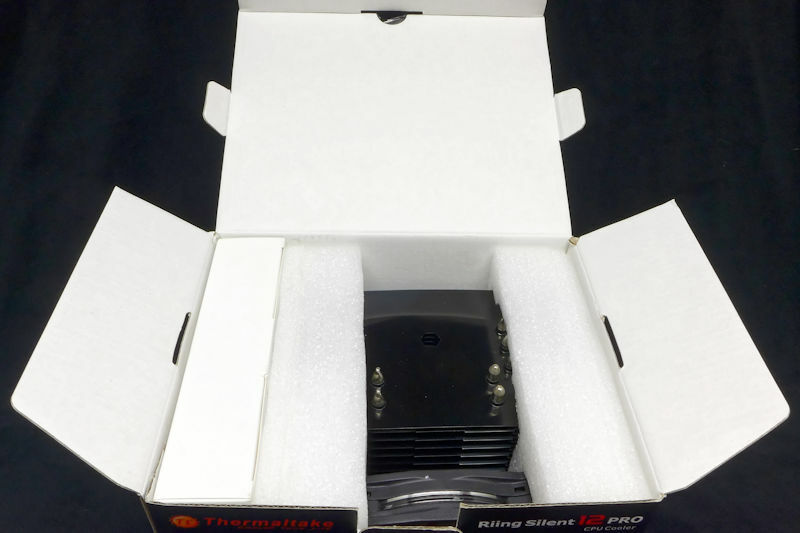 When opening the box the heatsink and fan are sheltered by foam. On the side, one can see a white box that holds the small parts and the Low-Noise Cable. Now here one can see those small parts and the accessories. 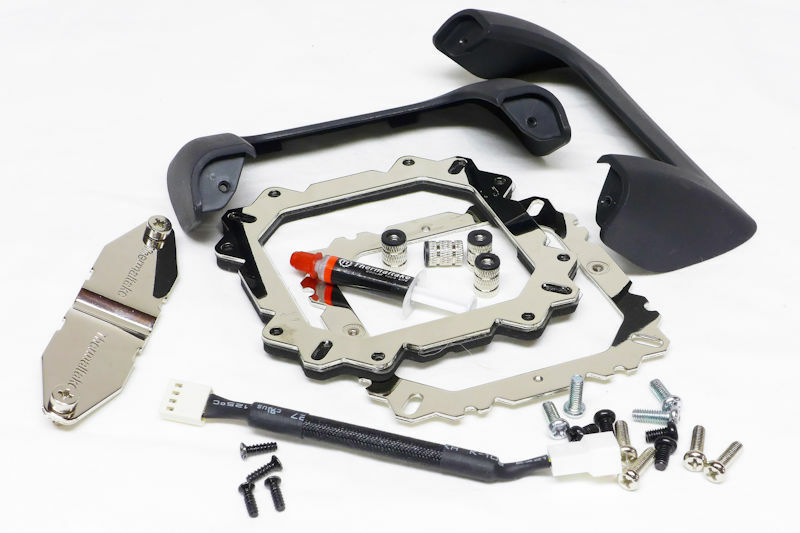 On the far left is the Mounting Plate (one can also call it a crossbar). 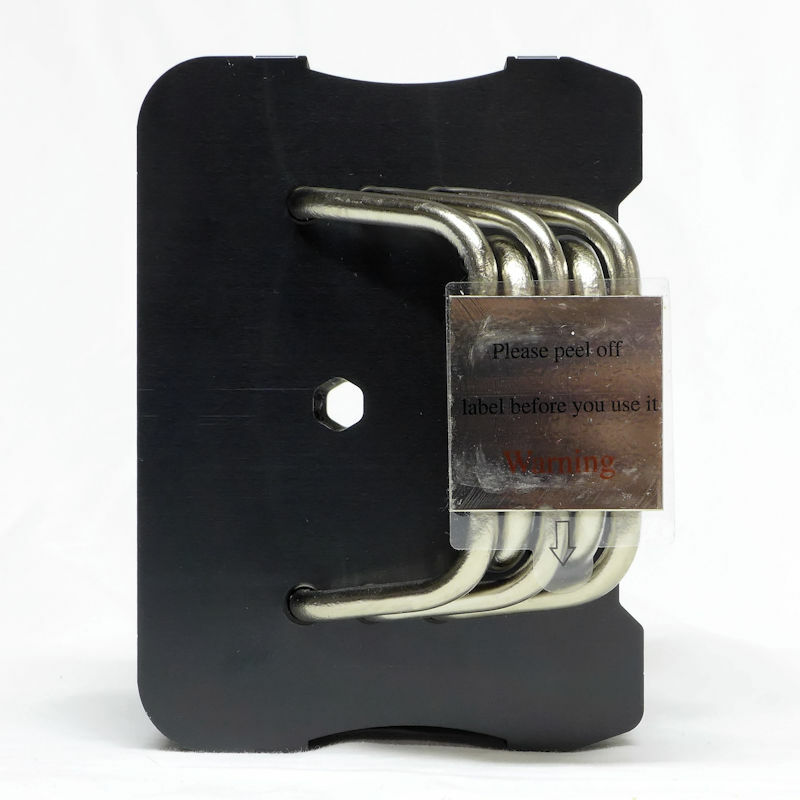 You’ll also find a pair of fan clips that hold the fan to the front of the heatsink, the backplate and the bracket along with all the necessary hardware needed for installation. 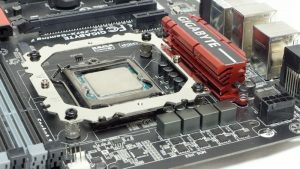 Thermaltake has also included a tube of thermal paste and a Low-Noise adapter. 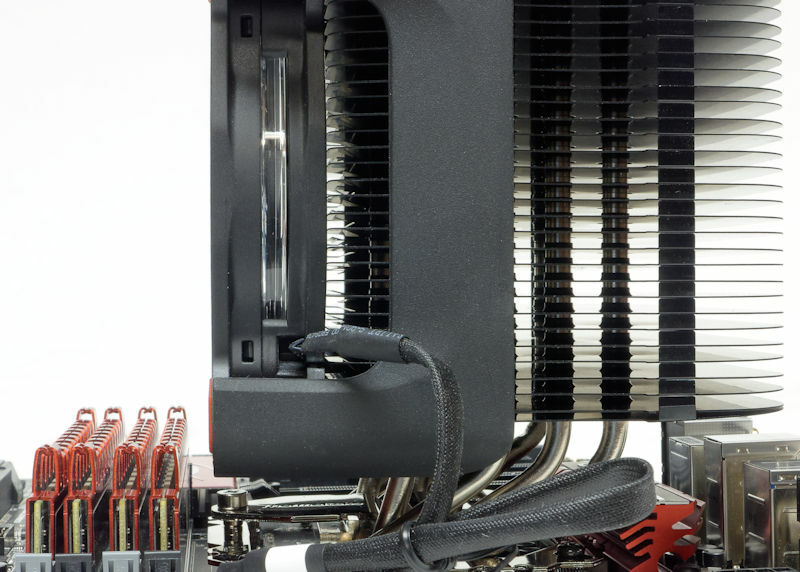 In a side view of a heatsink, one can see how the screws go into the fan’s frame, connecting with special clips holding the fan to tower. The fins, though large, are spaced far apart, keeping airflow noise down. 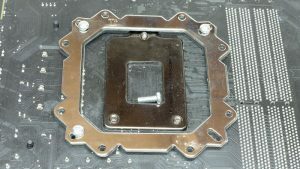 Another picture shows the heatsink with the fan removed. The fronts of the fins are bent as if they are ailerons shaping airflow. 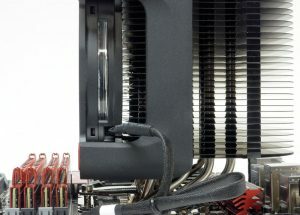 In the intake view of Thermaltake’s fan, one can see the scalloping on the blade tips. This allows the blades clearance for the ring LED that lines the inside of the fan’s frame. The second image shows the exhaust side of the fan revealing the vibration-absorbing pads on the corners of the fan. The bottom of the heatsink consists of a monoblock contact plate with five heat-pipes shooting running through it. 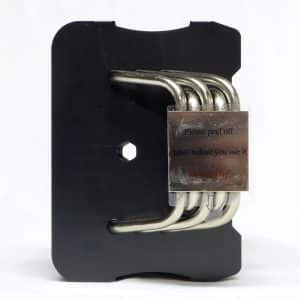 The Silent 12 Pro ships this with a sticky protective label on the block’s surface which needs to be removed before using it. 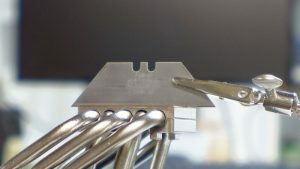 The hole we see goes through the entire heatsink to allow a long screwdriver to fit through for tightening the bracket. 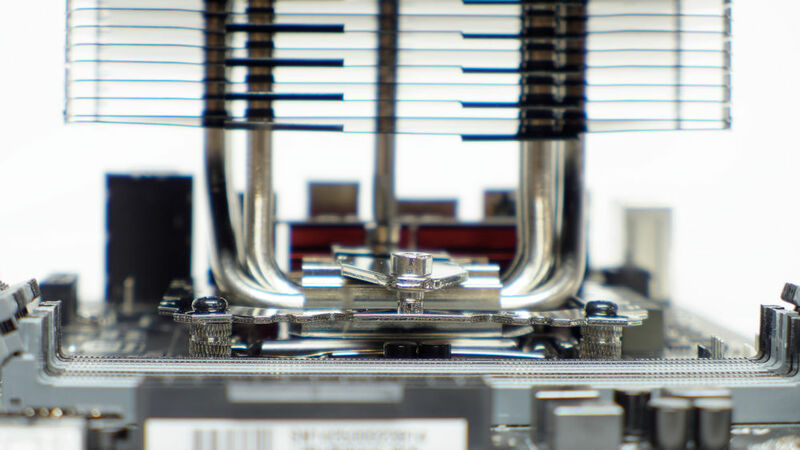 A top view of the heatsink shows the top of the screwdriver passage again and layout of the heat-pipes. 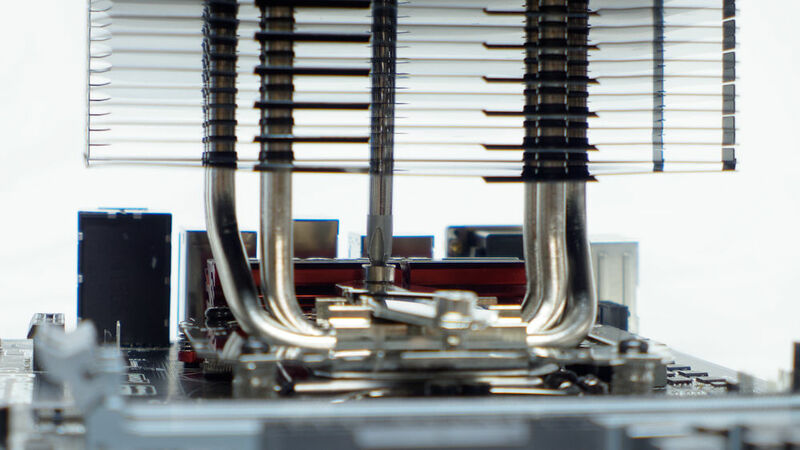 The first set of heat pipes are spaced closer to together than last heat pipes, presumably to optimize heat transfer. 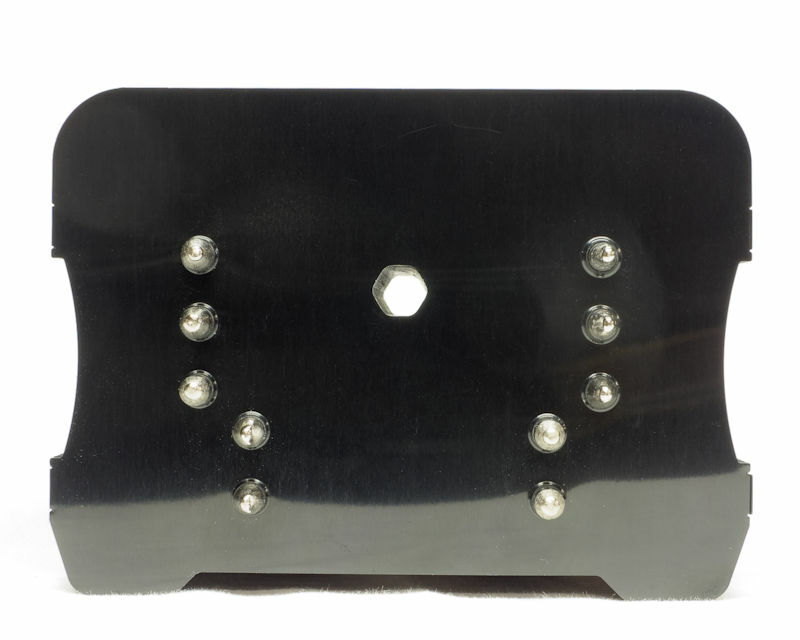 Here is a closeup of the backplate with spacer nuts inside it. 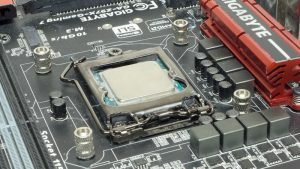 We can note the side which contacts the motherboard has a cushion to protect against short circuiting on the board and gives it a stable base to mount to. 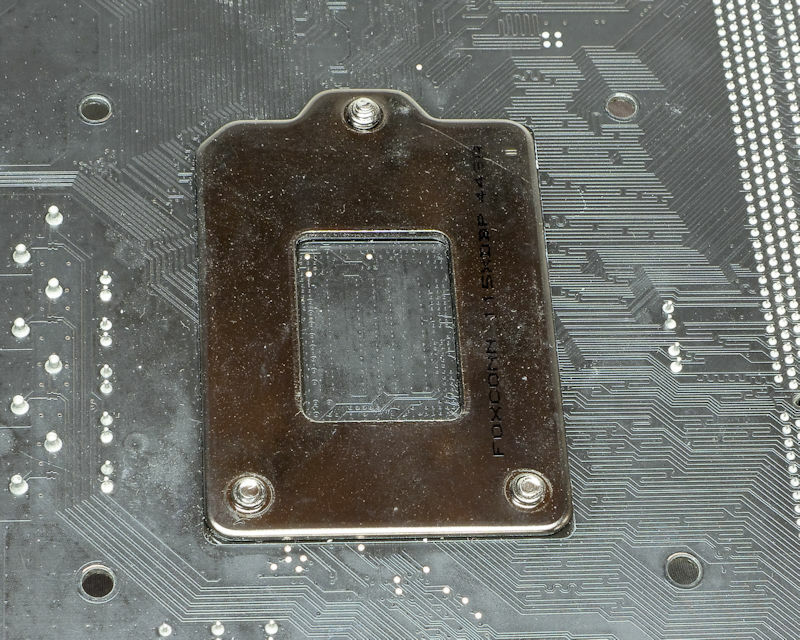 Note the cutout in the foam matches the keystone appearance of an Intel socket. 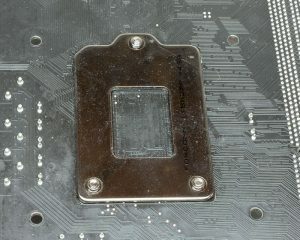 In this picture, one can see a backplate mounted on an Intel socket with three middle length screw inserted and a fourth ready. The manual tells us these are 13.3 mm screws. 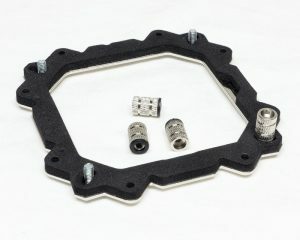 On the top, we can see the four nuts attached to the screws securing the backplate and ready for the bracket installation. The nuts also act as spacers, allowing one to affix the bracket with the shortest screws, 9.6 mm. 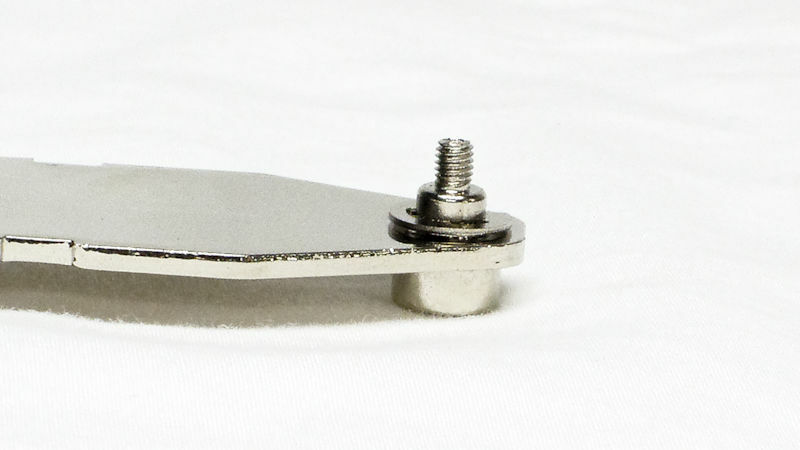 This is one flat contact surface. In the left image, one can see that the contact surface is flat in the direction of the airflow. The right picture shows the razor blade lying across the path the airflow will take. It too is flat. 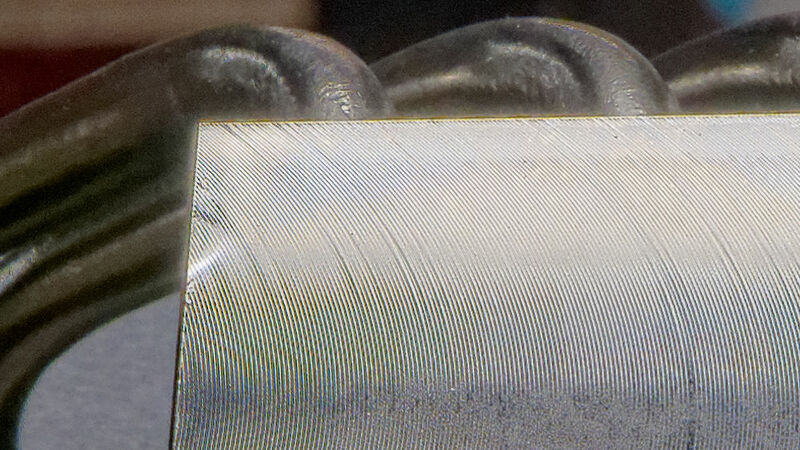 The contact surface itself is scored by tiny grooves. These appeared despite the residual adhesive from the peeled-off protective film. A cleaned surface shows the same grooves. You may think this is simply an unpolished contact surface that shows tool marks, but is it really? Were those grooves left it for a purpose? Please feel free to discuss this in the comments. NB — we are reaching out to Thermaltake and will update the article when we have the information. 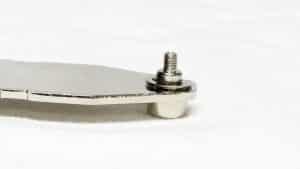 Returning to the “Mounting Plate” (crossbar) we see that the screws have a positive stop to prevent overtightening. However, the spring action is provided by the “plate” itself. There are no separate springs. In the first picture, the near screw is in focus. 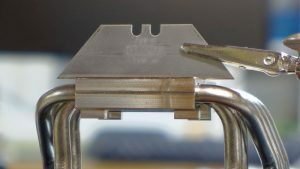 It shows how the tensioning screw is tightened all the way down until it reaches the positive screw stop. No chance of overtightening. But no spring here. 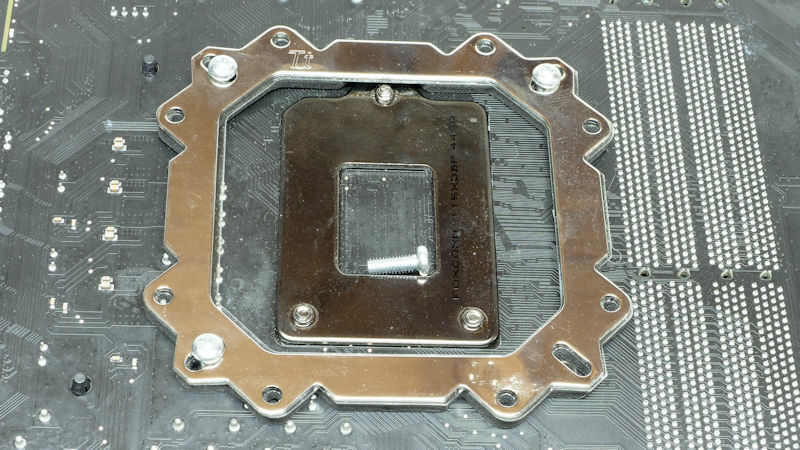 In the second picture, the far screw is in focus, along with the screwdriver and the heatpipes. This picture shows how the screwdriver penetrates the fin stack to engage the tensioning screw on that side. In the pull-away picture, we see how the screwdriver comes down to tighten the back screw you’ll also notice that this cooler does not interfere with tall RAM since it doesn’t extend into the DIMM slot area of the motherboard. In our final shot, we see the Riing LED in action. This is a low light picture allowing the motherboard and the heatsink show off their effects. 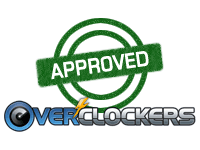 The all-core overclock chosen for this series was 4.8 GHz, which equates to the CPU using 127 – 134 watts. 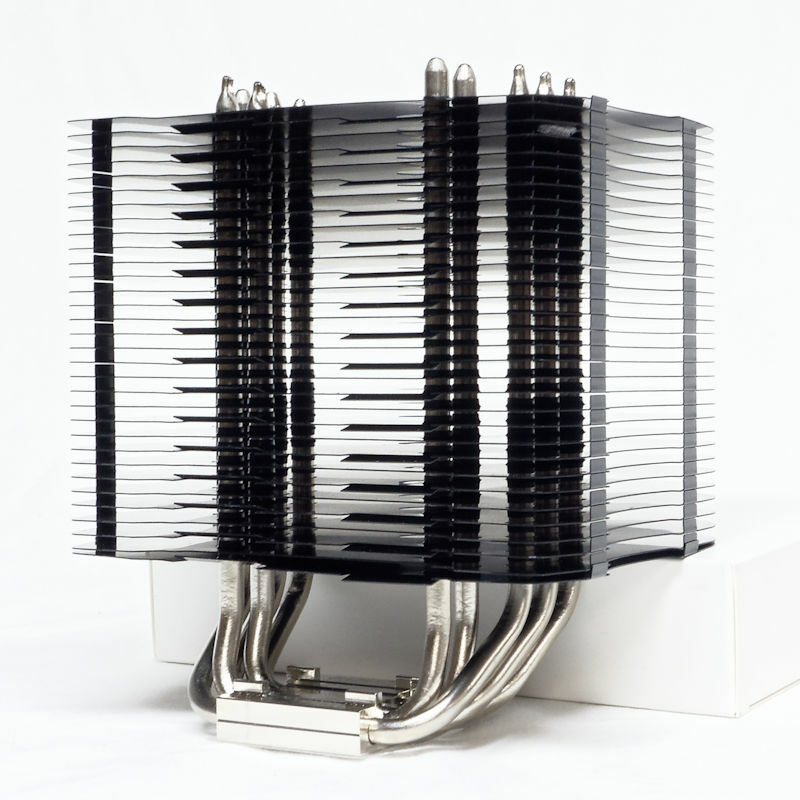 This particular range was chosen so that the heatsink both without and with the LNC could be tested. The Vcore was set manually to a static mode for testing consistency. 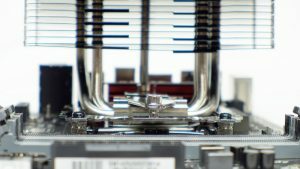 After each heatsink was mounted, the temps were not measured for a day to give the TIM time to spread and thin out. Linpack operates in bursts. When the temps are rendered graphically, the traces look like a series of plateaus separated by valleys. Since you are interested in how well a heatsink cools, I measured the temperature plateaus. The Intel Power Gadget can keep track of the power used in watts and the temperature of the cores in °C. The gadget’s log was set to make a measurement every second. Each heatsink ran three times, 30 minutes per run. The runs were averaged. As you can see, the program occasionally spikes. These spikes generally go into the 90’s. When they hit 100 °C the Vcore must be reduced. That did not happen here. The temperature of the air entering the heatsink was logged every five seconds; the runs were averaged. The temps you see in the Results section represent average core temps minus average ambient temps. 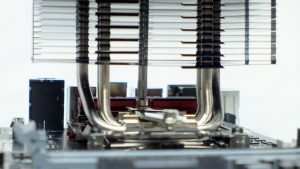 The sound pressure level was recorded a meter away at a position “above” each heatsink in decibels with an A-weighting (dBA). While SPL is at best an approximate measure of what we hear, it is all we have. The SPL ratings you will see are SPL minus 31 dB, which sounds like a silent basement. Now we are ready to see how well this heatsink did. Remember that these are net temps which are overall temperatures minus the ambient room temperature to aid in achieving consistent results. It should also be noted that Linpack with AVX2 is an extremely heavy workload and typical usage would be much cooler and quieter than the results delineated here. All the heatsinks save one (the top result) had one fan. The three best results had 140 mm fans. 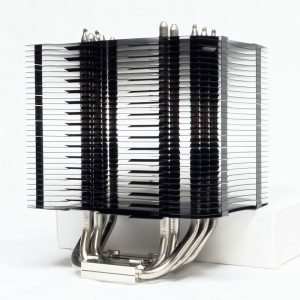 As might be expected, the lowest three results came from 120 mm heatsinks. 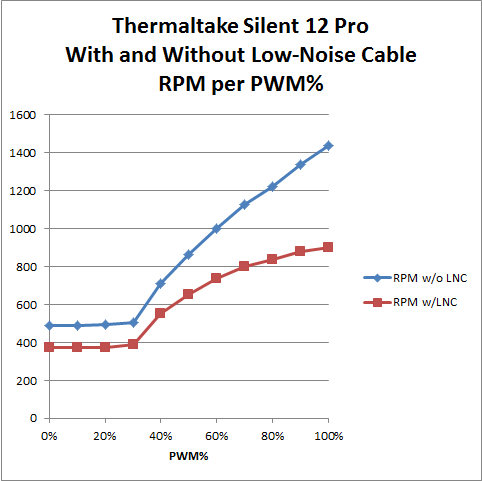 Something else: the Thermaltake Riing Silent 12 Pro was silent when used with the low-Noise Cable. Although I could hear it — barely — my SPL meter could not register it at all. As far as the machine was concerned, this heatsink made no noise. PWM response in the next chart. 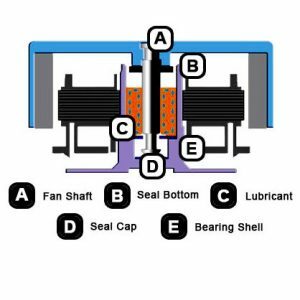 Without the LNC, the fan operated at 1000 RPM or lower between zero and 60%. With the LNC, of course, the heatsink ran silently across the whole PWM spectrum. 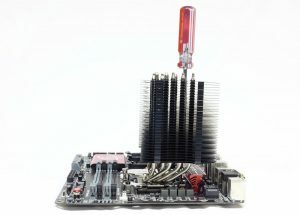 Since this heatsink will stay under 911 RPM during most of its life, it means that one can expect a silent heatsink. The Thermaltake Riing Silent 12 Pro Red version is available at Amazon.com for $59.27. 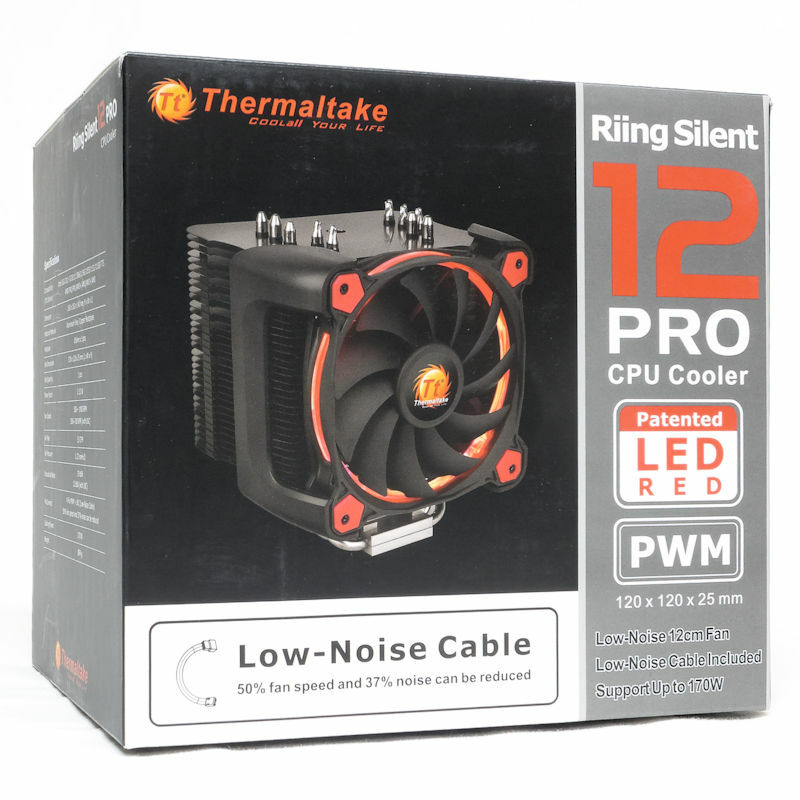 The Thermaltake Riing Silent 12 Pro Red version is available at Newegg for $59.26. 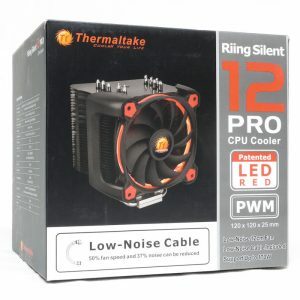 The Thermaltake Riing Silent 12 Pro Blue version is available at Newegg for $57.91. 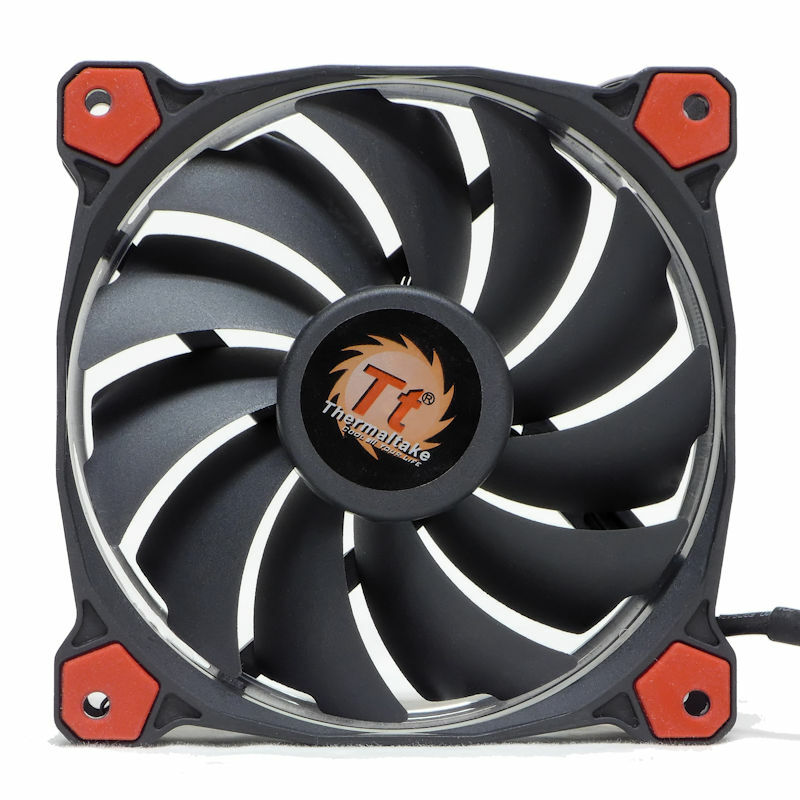 The Thermaltake Riing Silent 12 Pro Red is a compact heatsink that goes about its business quietly. 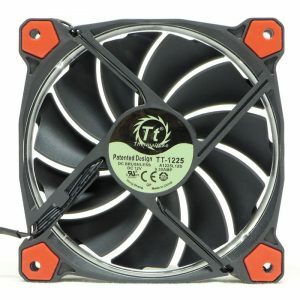 Thermaltake clearly spent a lot of engineering resources on their fan ending up with a silent performer. It has the same number of blades as a 140 mm fan, but they are more tightly swept. 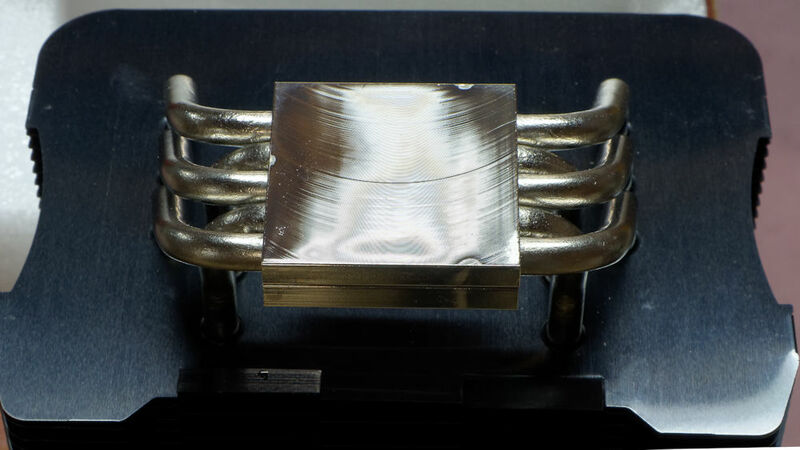 This heatsink will keep a 6C/12T CPU in the i7-8700K under control at 4.8 GHz. Not bad for a 120 mm heatsink. Especially considering that while using the Low-Noise Cable the heatsink was dead silent. 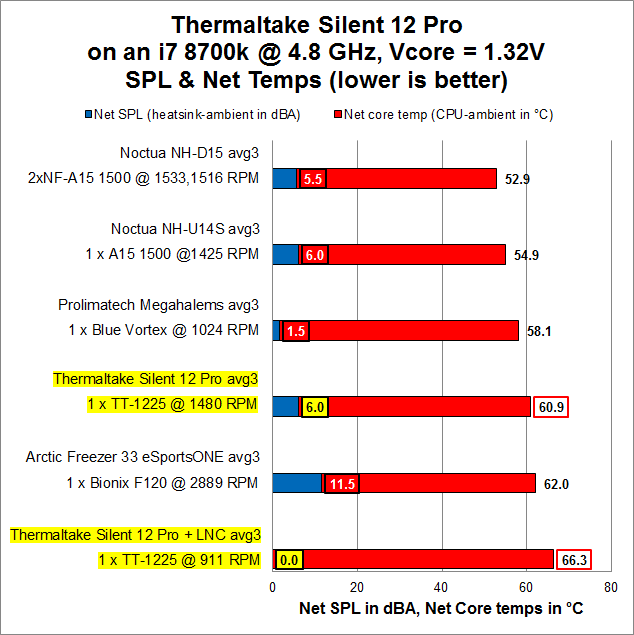 Silence was a design consideration for Thermaltake, and they succeeded admirably. The mounting was fiddly, with all the screws, but it went well enough. No rehearsals were needed to get it right, but do consult the manual when you go to choose what screws to use when — it is not obvious and the manual provides welcome help. The only thing lacking was that the user should be able to fasten the crossbar mounting plate to the contact block to make mounting easier. I suspect the price reflects the effort put into designing the fan. 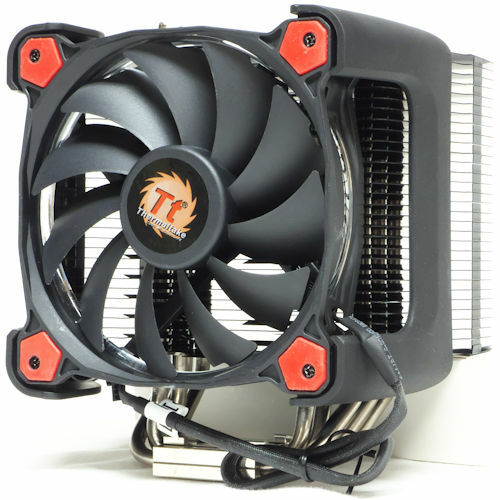 Thermaltake seems to have kept this fan to use in later heatsinks but changed the fin stack. 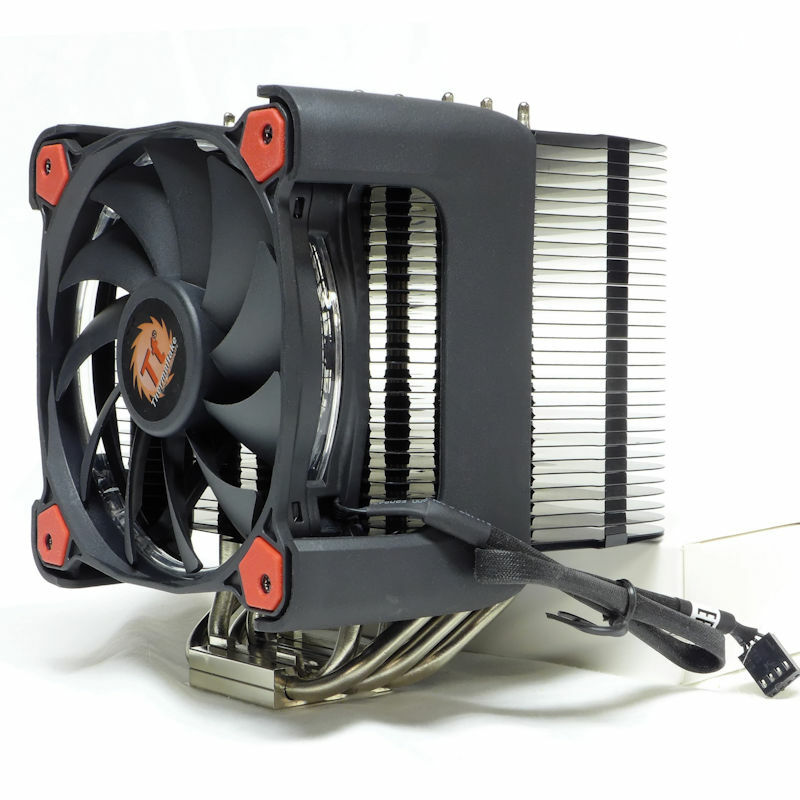 Because of this fan, the heatsink lives up to its “silent” name.